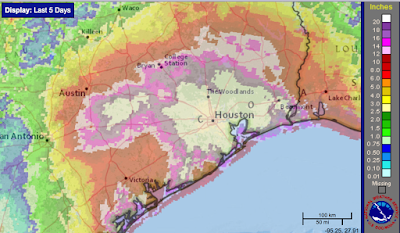 Here is the amount of rain that has fallen on southeast Texas, including Houston and Beaumont, over the last five days. And, here is the forecast for additional rainfalls the next five days. Yes, that is a forecast for another 20" inches of rain -- bringing the storm total to nearly 50 inches -- from south Houston along the northern edge of the Ship Channel. 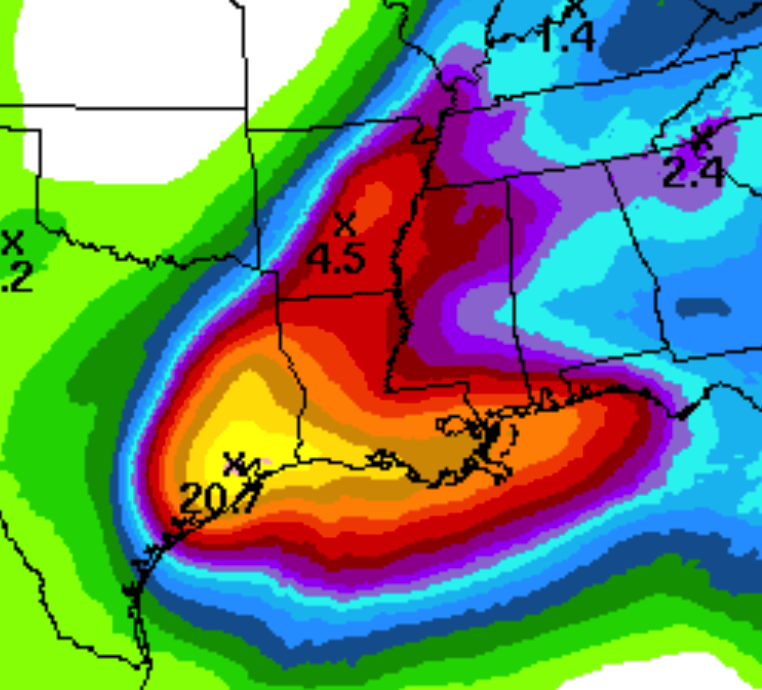 Serious flooding is likely going to extend into western and southern Louisiana with an additional 10+ inches of rain in addition to the 5-10 inches that has already fallen around Lake Charles. Note also the risk of flooding rains (nearly 5 inches) extends into Arkansas. Yes, the center of what is left of Harvey is moving back over the Gulf. However, Harvey does not have an eye and it is unlikely that significant strengthening will occur. However, with gusts to 45 mph and completely saturated soils, the risk of power failures may increase due to toppling trees where the higher gusts occur.